Acknowledgements; To the reader; Introduction; Gestures and signals: take a bow: bending at the neck or waist; Hi, Hitler! Arm salutes at various angles; Do a nose job: rubbing and sniffing as a greeting; XXXX! 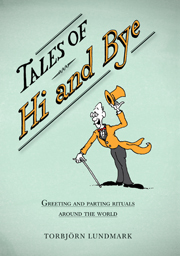 The heartfelt kiss; Flashy hello: the eyebrow flash; Getting the shakes: the story of the handshake; Slaps, daps, thumps and bumps: not so gripping handshakes; I dips me lid: the hat as a courtesy tool; Hello? Hell, no! Greeting refusals; Waves of emotion: greeting from a distance; Customs and behaviours: no hug for Dr Livingstone: a demonstration of restraint; It hurts to say goodbye: the Parthian shot; How stiff can your upper lip get? Avoiding strangers; Chinese whispers: greeting and parting rituals in China; From Russia with love: sit on your case and say goodbye; Cut it out! How to avoid saying 'hello'; I don't speak to my mother-in-law: avoidance language; Phonethics: telephone mannerisms; Thanks for having me on! Names and forms of address in the media; Eskimodesty: greeting and visiting in the Arctic; Names and addresses: what's so good about it? The curious nature of 'good-' greetings; Ahoy, ahoy! Pick up the phone! 'Hello' and its uses; The unlucky Mr Szczęściarz: foreign names in foreign places; Wang is King in China: too many people; not enough names; Finding Björk: Icelandic names; Yoo-hoo! Who? You! How Swedes don't address each other; Mister Doctor: titles of medicos, surgeons and barbers; I forget my name: loss of first name by marriage; When your coz is your sis: kinship terms; You, thou and other politenesses: familiar and polite 'you'; Include me out! Dual, trial and other grammatical curiosities; For me to know and you to find out: naming and name taboos; Bye-bye! How things have changed; Postscript; Notes; Sources; Index.